The law of attraction is a wonderful thing for many reasons. First, it shows us that we are responsible for our own lives and that we can create our lives through conscious choice. Many people in this world feel like they are victims who are at the mercy of outside forces beyond their control. Learning about the law of attraction is empowering for these people and is surely a huge step forward in their personal evolution. For this reason, I am very happy that more and more people are being made aware of this universal law. 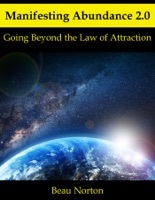 In this short guide, however, I am going to teach you things that go beyond the law of attraction, because I believe it is very important for us all to continue to evolve to higher and higher levels of spiritual awareness. Working with the law of attraction is helpful at a certain point in our lives. It gives us a newfound sense of power and freedom, but what I am about to share with you will take you beyond those feelings into a much more satisfying place.